The US dollar appears to be unfazed by this morning’s mixed economic data. An improvement in consumer confidence has failed to help the dollar while the weaker news has pretty much been baked into the markets. Christmas and New Years week is a time when traders are more focused on seeing family than making profits. It is probably truer this year than most because of the sharp volatility in the financial markets and the deep losses endured by most investors. Third quarter GDP remained unrevised at -0.5 percent even though personal consumption slipped and core prices eased. Investors are more worried about the Q4 numbers than the Q3. The global recession and the stronger dollar could take a big bite out corporate earnings and growth. The housing market also remains weak with new home sales falling for the fourth consecutive month and existing home sales falling by the largest amount on record. Sharp discounts on new homes is helping to slow the pace of falling demand. The one piece of good news that we did see this morning was consumer confidence which was revised upwards in the month of December. Given that almost everyone knows someone that has been laid off, the price of gasoline is the only reason to cheer this holiday season. Prices at the pump have fallen close to 60 percent from its summer highs. For drivers, lower gas prices is like a tax cut. At a time when salaries are being frozen and bonuses are being reduced, a tax cut in the form of lower gasoline prices is welcomed with open arms. Why Does the Drop in Oil Prices Matter? Oil prices are trading at $33 a barrel and in retrospect, it is almost hard to believe that the price of crude was more than $140 a barrel this summer (gasoline prices were greater than $4.00 a gallon). Since those highs, oil prices have plunged more than 70 percent and gas prices are down more than 50 percent. If we discount the run up in the first half of the year, we have still seen a 55 percent drop in oil prices since January. Crude prices matter for a variety of reasons. Lower oil prices help to cushion the ever dwindling pocketbooks of US consumers. 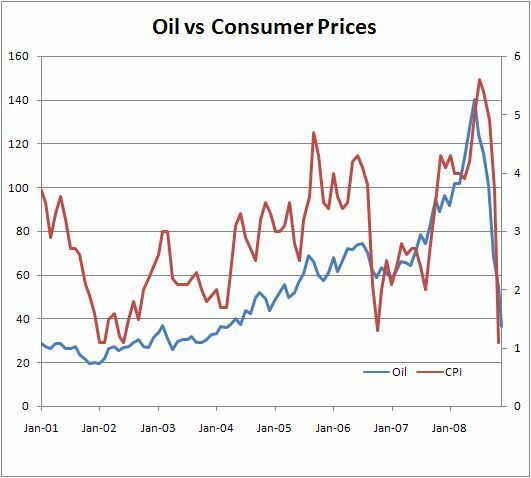 In addition, oil has a direct correlation with consumer prices. With CPI falling for 2 consecutive months, the risk of deflation is growing. Take a look at the strong correlation between the price of oil and consumer prices. US retail sales and producer prices were basically in line with expectations but that does not undermine the fact that the data was very weak and confirms that the Federal Reserve will be cutting interest rates by 75bp next week. USD/JPY hit a 13 year low last night after news that the automaker bailout plan is not going happen before the new year. Everyone had hoped that the automaker saga would come to an end, but lawmakers are not letting that happen. On Wednesday, I said that USD/JPY could hit to a new 13 year. At that time, the currency pair was trading at 92.50-93.00. The possibility of the US taking interest rates below Japanese levels should keep the US dollar soft going into the Fed interest rate decision on Tuesday. Consumer spending fell for the fifth month in a row while producer prices dropped for the second straight month. The two biggest inputs into GDP are retail sales and trade. Consumers cut back spending more aggressively in October and November which suggests that GDP growth could take a big dive in the fourth quarter, especially with the widening of the trade deficit. GDP could decline as much as 4 to 6 percent in Q4, which would be the largest contraction in growth since the 1980s. In the first quarter of 1982, GDP fell -6.4 percent. A 4 to 6 percent drop in GDP would not be out of the ordinary given the current conditions in the US economy. In the fourth quarter of 1990, GDP contracted by 3 percent and in the first quarter of 1991, it contracted by 2 percent. The currrent recession is worse than the one the US economy experienced in the 1990s, so a contraction in growth exceeding 3 percent would actually be expected. The biggest drop in consumer spending came from gasoline station receipts. Prices at the pump have fallen more than 50 percent since the summer and gas stations are suffering as a result. The only silver lining in the retail sales report is the fact that not every sector saw slower sales. Electronics and sporting goods were in demand but this rebound after at least 4 consecutive months of softer spending is probably related to Black Friday sales. This morning, the sun is shining on New York City and on Wall Street. President-elect Barack Obama was one of the few people that could have restored confidence in the financial markets through the appointment of a Cabinet members that the market trusts and a clearer plan of action for tackling the economic crisis. On Friday, his appointments for Treasury Secretary and the Secretary of State were leaked, sending stocks soaring and according to the Washington Post, Obama and leading Democrats are planning a 2 year fiscal stimulus package that could amount to 5% of GDP. He also named former Treasury Secretary Larry Summers to head the National Economic Council. Summers is Geithner’s mentor and was one of the leading candidates for Obama’s Treasury Secretary post. With 2 well respected powerhouses on his Economic Team, Obama has a good chance of turning the economy around in late 2009, early 2010. The new Administration is beginning to grease the wheels and the market is liking it. However in order for the gains in the equity and currency markets to be sustained, hope needs to supersede reality because as of Tuesday, the US economy should be in a technical recession. Third quarter GDP numbers are due for release and after contracting by 0.3 % in the second quarter, first quarter GDP growth could fall as much as 1% (consensus is -0.5%). The US economy would not be a stranger to such a deep contraction as growth fell by 1.4% in the third quarter of 2001, 3% in the fourth quarter of 1990 and a whopping 6.4% in the first quarter of 1982. It is no secret that the housing market is in trouble and the latest existing home sales numbers confirm that. Resales dropped 3.1% to 4.98 million rate, which is the lowest since June 2008. The big story however is the drop in house prices, which was the largest on record. The combination of a slowing economy and tight credit markets has prevented real estate from recovering and with the recent layoff announcements, I expect demand to slow even further. Citigroup was another major uncertainty that made the markets nervous. The US government has announced that Citi will be receiving $20B in cash from the Treasury and $306B of asset guarantees. In return, the US government will receive preferred shares in the bank. This step indicates that the Bush Administration believes that the financial system could not afford another big bank failure which is probably right. US equities turned as traders realize that everyone is pinning too much hope on China. The reality is that China’s stimulus plan will not save the global financial and economic crisis. Instead, the only thing that is assured is that at one fifth of 2007 GDP, China will have less money to spend on financing the US’ current account deficit. Every country is doing their best at stimulating domestic growth and that is exactly what China is focused on right now. Their priorities are at home and not abroad and their plans to invest in low-rent housing, infrastructure, rebuilding programs and tax breaks on capital spending are aimed at helping their economy cool at a more manageable pace. However it is not a bailout for the financial market and will not be enough to stimulate global growth. Some foreign manufacturing and construction companies will benefit from China’s investment in infrastructure, but the bottom line is that like the rest of the plans announced by developed governments, it shifts and not creates wealth. We also don’t think that it is a coincidence that China made its announcement ahead of a busy data week that will surely confirm the continued weakness in the Chinese economy. With a need to focus domestically, Chinese demand for dollar denominated investments will decrease, especially after some particularly nasty losses incurred at the Sovereign Wealth Fund. Will there be Fireworks at the November 15 Meeting? World leaders will be headed to Washington for the Economic Summit on November 14 and 15. The hope is that we will see more detailed proposals on dealing with the economic crisis. Unfortunately as the date nears, investors are starting to realize that no substantial changes may come out of the meeting. With a little more than 2 months before the leadership changes in the US, the current administration may not want to commit to any major policy changes. But if they do, that is exactly what can turn the financial markets around (US President-elect Barack Obama has announced that he will not be attending the financial Summit). Although G20 finance ministers and central bankers pledged to jointly tackle the global financial crisis at this weekend’s G20 meeting, the disagreement between more or less state controls are becoming increasingly clear. It remains to be seen whether there will be fireworks at this weekend’s emergency summit.